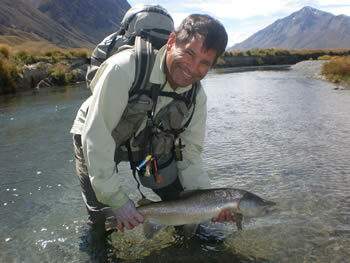 Backcountry fly fishing in New Zealand's South Island. Well conditioned 9lb brown trout – landed and in the safe hands of guide Paul McLauchlan. 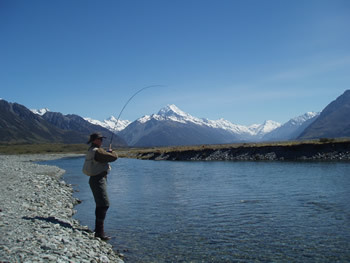 New Zealand flyfishing has long held an outstanding reputation as being one of the worlds top fly-fishing destinations. Its 2015 and the diversity of flyfishing river options seems endless and it is this complemented with their overwhelming friendly hospitality that makes New Zealand stand out from all the rest. With over ten years in the trout guiding business we have come to learn that almost all anglers seek something a little different while on their flyfishing vacation. Whether its chasing our highly prized back country large trophy Browns and Rainbows or simply just enjoying great back country fly-fishing in small to medium free stone rivers, we know all too well the importance and rewards of a well planned and executed fly-fishing itinerary, placing the client with the right guide in a great location with the best accommodation to suit your budget is what we specialize in. 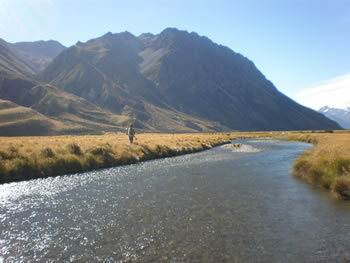 Our main flyfishing operations are carried out in the heart of New Zealand’s South Island back country, its the head water streams in these vast valley systems that offer some of the clearest water in the world, the combination of these free stone streams, large trophy trout, and lush native forest backdrops that set the scene for the ultimate flyfishing experience. 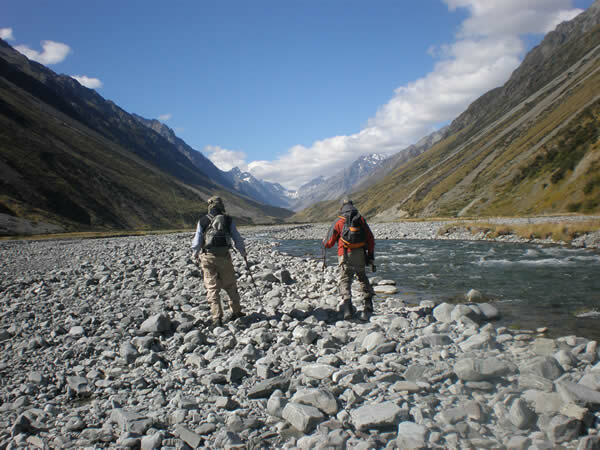 One of the more talked about moments on a standard guiding day is not only about the stunning scenery but more important is the fact we are fishing to sighted fish and the guides ability to see fish among the confusion of rocks and ripples this is truly the pinnacle of sight, dry fly trout fishing. 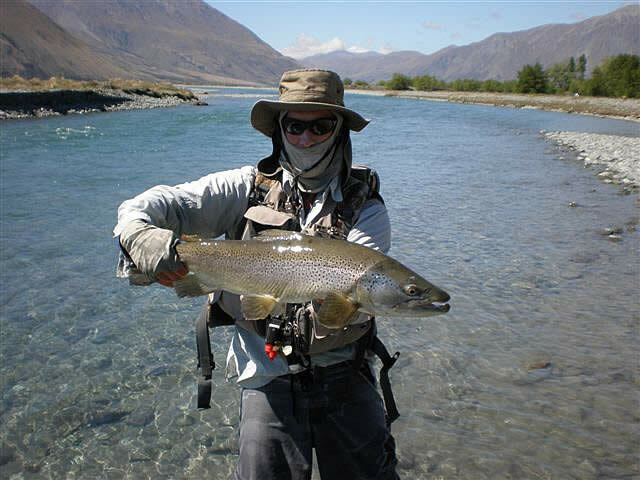 We welcome you to e-mail us about our flyfishing opportunities whether you are just seeking general information on flyfishing New Zealand or would like to talk about our itinerary options we look forward to hearing from you. Tom Montgomery (USA) with good condition brown. Mount Cook National Park, New Zealand. 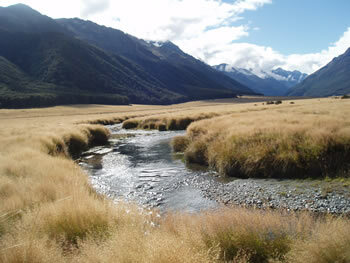 Back country spring creeks, South Island. The fly fishing season gets under way in a little over 6 weeks time. Good trout numbers are expected in our pristine spring creek waters this season. We’re now taking advance bookings for the season. ... or have a question, or wish to make a booking?